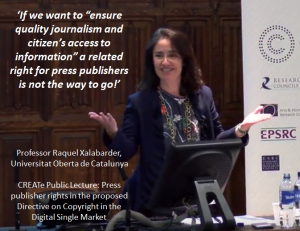 As part of CREATE’s Public Lecture Series in autumn 2016, Professor Raquel Xalabarder, Chair of Intellectual Property, Universitat Oberta de Catalunya (UOC) discussed the press publisher rights in the proposed Directive on copyright in the Digital Single Market. This lecture took place on Wednesday, November 2nd at the University of Glasgow. A video recording of this lecture along with Professor Xalabarder’s slides and a CREATe Working Paper are now available from our event resource page.